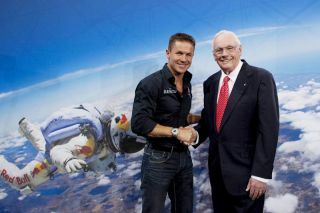 Austrian skydiver Felix Baumgartner meets astronaut Neil Armstrong on Aug. 5, 2010. Baumgartner will soon attempt to set the world's highest skydiving record from near the edge of space. A daredevil will soon attempt to break the world record forthe highest skydive ? set 50 years ago today ? and be the first human tofreefall faster than the speed of sound, and from near the edge of space. On Aug. 16, 1960, U.S. Air Force Captain Joe Kittingerskydived from an altitude of 102,800 feet (31,333 meters) and lived to tell thetale. Attempts to break Kittinger's record since have resulted in failure andeven death. Undeterred, Austrian skydiver Felix Baumgartner is slated toattempt a jump from some 120,000 feet (36,576 meters) abovethe surface of our planet later this year. To attain this stratospheric height,Baumgartner will take a three hour trip in a pressurized capsule raised aloftby a giant helium balloon. Baumgartner's team expects him to reach supersonicspeeds during his nearly 23-mile (37-km) descent back to Earth. Ifsuccessful, Baumgartner will set the new bar for the world'shighest skydive. Energy drink company and extreme activity promoter Red Bullis sponsoring the project, called Red Bull Stratos. The record-setting skydiveshould help inform escapeplans for astronauts and space tourists alike by extending the "safetyzone" where making a bailout is still in the cards. Besides crossing the sound barrier ? where forces can breakapart aircraft ? the journey will present a host of other hazards toBaumgartner. For starters, he could freeze in the minus 140 degreesFahrenheit (minus 95 degrees Celsius) temperature, develop nitrogen bubbles inhis blood, and spin out of control and lose consciousness. To withstand the frigid, thin air, Baumgartner will don aflexible airtight spacesuit like that worn by NASA and United States Air Forcepersonnel. After an intense six-minute plunge through the thickening atmosphere,Baumgartner is slated to deploy a parachute around a mile above the ground. Though the goal is to have him land near his original launchsite, he might drift as far as 200 miles (322 km) off target. In early August, Baumgartner received a visit andencouraging words from explorers who are also no strangers to high-flyingdanger. Baumgarter met with U.S.astronaut NeilArmstrong, the first human to walk on the moon, as well as Russiancosmonaut Alexei Leonov, the first person to spacewalk, and European SpaceAgency astronaut Thomas Reiter, who has spent a great deal of time in space. Armstrong, who was celebrating his 80th birthday, noted thatall four men are known for their penchant of refusing to stay inside theirvehicles. "I find it interesting that we have four fliers here,all of which are better known for getting out of something than for flyingit," Armstrong said in a statement. "We can't all stay inside flyingmachines." Adam Hadhazy is a staff writer for TechNewsDaily,a sister site to SPACE.com.